As you plan your move into one of our Springs luxury apartment homes, "break" the streak with these expert tips for packing and transporting fragile items. You might be able to throw clothes, books and other sturdy items into a box at the last minute, but that won't work with breakables. Start working on your game plan early so you have time to gather supplies and pack carefully without rushing. Make sure you have a table or large surface free when you're ready to start packing. Don't just grab the nearest box. Smaller containers reduce the risk of items bumping up against each other. Avoid the temptation to overpack. You might have a few more boxes to carry, but it's a small price to pay for the safety of your possessions. Use several pieces of packing tape to secure the bottoms of boxes. Place a piece of bubble wrap or a layer of peanuts in the bottom of each box to serve as a buffer. Start with the largest and heaviest items at the bottom, working up to the smaller and lighter ones. Fill empty spaces (including the insides of vases and other hollow items) with crumpled newspaper, pieces of cardboard or other pliable materials to minimize vibrations. Foam peanuts are great because they can work their way into small or awkward-shaped crevices. Leave a one-inch space at the top of each box with another layer of bubble wrap or peanuts. This will protect the contents in case another box is placed on top of it. Once the box is packed, close the flaps and give it a gentle shake. If you feel movement or hear noise, add more packing materials before sealing the box. Write "FRAGILE" clearly on all sides and tops of boxes. Use blankets to wrap mirrors, artwork and other oversized or awkwardly-sized items. No matter how buff you think you are, don't risk dropping your fragile items. 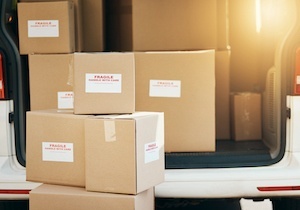 Use a cart or dolly to transport boxes to and from the moving truck. We want your experience at our Springs luxury apartment community to be pleasant from day one. Our on-site management team is happy to help with tips and suggestions for a smooth move-in day.